"A boxty on the griddle, a boxty on the pan, the small one in the middle, is for Mary Ann" this Irish rhyme may not be heard in Colombo city (a boxty is an Irish potato laden pancake). Yet the discerning gourmets and revellers are indeed making positive vibes about Shamrock, a distinct pub with an Irish influence. Located on Chatham Street, Fort, the cozy club and lounge is further supplemented by the Red Snapper restaurant. Chatham Street itself has an alluring charm with its colonial architecture. The restaurant and lounge displays a rustic ambience, with light resonating from some antique chandeliers, that soothes your mind as you enter. The high wooden roof adds to the cool atmosphere. Above the bar counter is a dainty display of glasses suspended on strings. The Shamrock has three private dining rooms, each with its different hues. The cushioned chairs are a work of a craftsman. The bar serves some refreshing drinks including Guinness, which obtains its unique flavour from the roasted barley. There are also Irish whiskies, especially Tullamore Dew and John Jameson. The Lychee and Passion Mojito and Strawberry Friday seem to be very popular amongst the guests. A drink with a vintage twist caught my eye- Ceylon Mule a blend of arrack, lime and ginger beer! I was bewildered when a guest asked the barmen for an Irish Car Bomb. It turned out to be an invigorating cocktail made with beer, whisky and Irish cream!!! The resident Chef Darren Smith and his team serve a mouth watering myriad of cuisine. The Cajun seafood jambalaya, red snapper fillet and lobster ravioli are firm favourites. 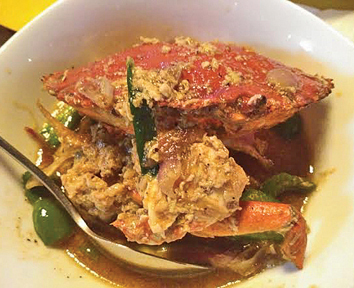 I was surprised to find a spicy crab rasam, which was brilliant. I enjoyed a lamprais, which was served in the right portion. If it was served in the traditional banana leaf it may have given a pleasing visual, yet change is the order of the day! The apple pudding that I ordered for dessert had a crunchy top layer just about right and blended well with the vanilla ice cream. Friday and Saturday nights are quite happening. The DJ belted out some cool melodies infused with pulsating beats. As I walk out of the Shamrock, I feel relaxed. The lights seem to somehow beautifully enhance Chatham Street.